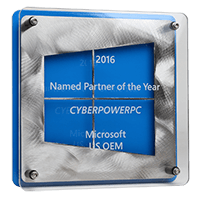 CyberPowerPC , the leading builder of custom gaming computing solutions to the end-user, was awarded the US OEM Named Partner of the Year designation by Microsoft for 2016. 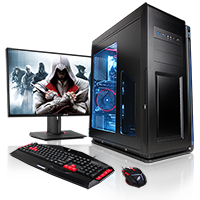 The honor highlights CyberPowerPC's close work with Microsoft to understand and combine the latest Microsoft software with hardware expertise to create custom gaming computing solutions for gaming consumers of all tiers. At the Microsoft Worldwide Partner Conference in Toronto, Canada, Microsoft U.S. OEM proudly announced the 2016 U.S. OEM Partner Award winners. The U.S. Partner Awards Program gives Microsoft the opportunity to recognize its top partners at a global event. It acknowledges the extraordinary contributions of Microsoft partners serving its customers throughout the past fiscal year. "Our focus on quality, performance and pricing via custom gaming solutions was the key to a successful year selling Microsoft Windows and Office products," said Eric Cheung, CEO at CyberPowerPC. "We've invested a great deal of effort in not only providing the best gaming solutions in the market but also in the gaming community itself though our sponsorships of gaming events, professionals and academia which has made us a recognized global leader in gaming computing." Looking ahead, Cheung sees huge growth for CyberPowerPC. "We see vast opportunity in 2017 for the gaming market as gamers ramp up investments to upgrade their systems to meet the ever increasing demands of newer gamers optimized for the latest Microsoft operating system," said Cheung. 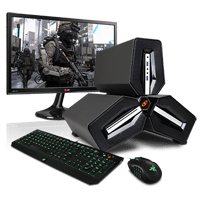 CyberPowerPC Gamer XTREME VR is priced below what you can buy all the parts for. 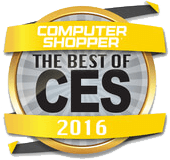 The CyberPowerPC Gamer XTREME VR gets our recommended award as it is a great mainstream gaming system that can do VR without breaking the bank. | by Ben Z. Gottesman. 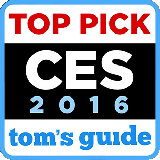 CyberPowerPC makes build-to-order PCs, primarily for gamers. 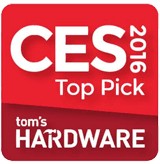 That can be a tough crowd to please but CyberPowerPC's fast, reliable systems are generating satisfied, loyal customers. Review Date: January 11, 2016.
Review Date: Jan. 8, 2016.
Review Date: January 8, 2016.